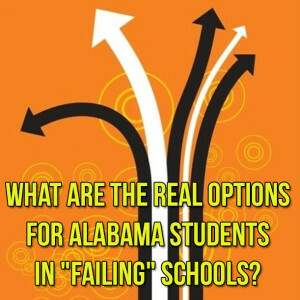 Alabama School Connection » What Are the Real Options for Alabama Students in “Failing” Schools? 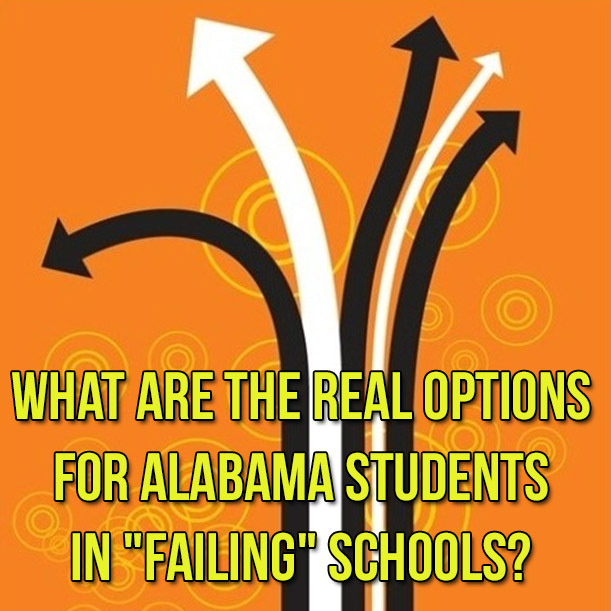 What Are the Real Options for Alabama Students in “Failing” Schools? 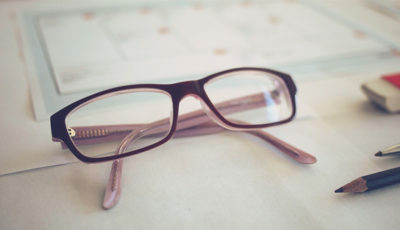 During the 2013 legislative session, the Alabama Accountability Act (AAA) became law, with the authors and proponents stating that the AAA would give children stuck in failing schools real options for transferring out of those public schools. Alabama now has a year under its belt and some additional numbers to examine. So let’s take a look at what those options are and whether all children in failing schools truly have access to those options. The whole transfer movement begins with the failing schools list. The ALSDE released the second annual failing schools list on January 16, 2014. Here’s a look at the calculations that put a school on the list. Here’s the latest list of failing schools, released in January 2014, effective for the 2014-2015 school year. Seventy-six schools are on the list, meaning that students in those schools have now been given a number of options for transferring out of those failing schools for the 2014-2015 school year. But are those options actually accessible? What Options Do Students in Failing Schools Have for Enrolling in a Non-Failing School? The Alabama Administrative Code 290-4-1, page 13, defines the options for students enrolled in failing schools. (a) Option 1 – The student will remain or enroll in the failing school. Okay. So first the student in a failing school has to seek enrollment in a non-failing school within their own district. 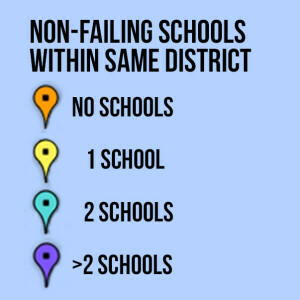 What if a non-failing school isn’t available in their district? Well then, that child in a failing school simply asks the next closest school district if that district will accept him as a student. What if that school system won’t accept the student in the failing school? Well then, that child can simply find a qualifying, participating non-public school. Which of the qualifying, participating non-public schools offer scholarships and how far away is that school? This document breaks it down by system. That didn’t seem like a whole lot of students, given all of the ifs and buts along the transfer-out process. 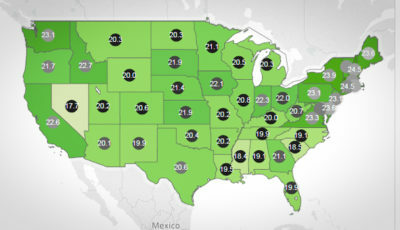 (1) Where the failing public schools are and whether there is a non-failing public school offering the same grade span of the failing school within the student’s district, and if so, how many schools there are to choose from. The information used in this set came from the ALSDE’s public data reports and the school directory. (2) Where the qualifying participating non-public schools that are offering scholarships are and during what time frame they were added to the list. The information used in this set came from the Alabama Department of Revenue. Take a close look at the map. Click this link to open the map in a new window. Zoom in. Look at where the schools are, whether the students within these schools have real options to transfer, either into a non-failing public school in their own district or into a qualifying participating non-public school. The failing public schools have a square contained in the marker. The qualifying participating non-public schools are blank within the marker. So if you see an orange or a yellow marker with a square in it out there in the middle of nowhere with no dark blue, green or red markers, chances are good that the students in that failing school won’t be transferring out. Unless they can transfer into a public school in a neighboring district. 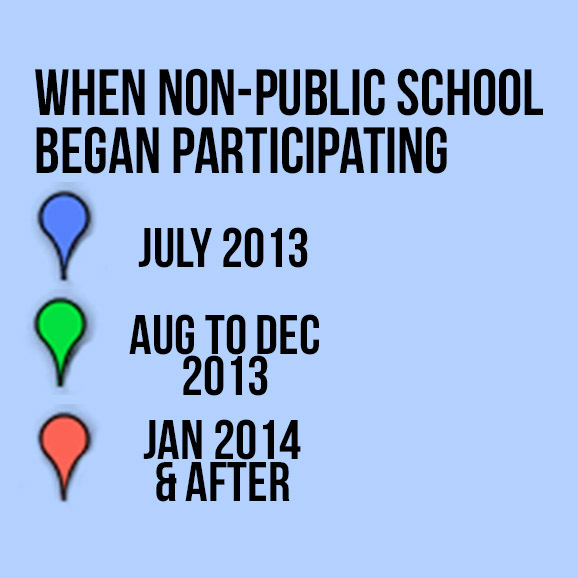 How Does a Student Transfer to a Non-Failing Public School in a Different District? Good question. 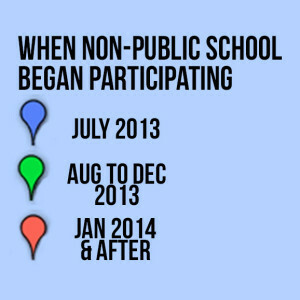 When HB84, the original AAA, was passed on February 28, 2013, legislators realized pretty quickly they had left a major component of the law undefined:, how local school districts would be able to keep children in out-of-district failing public schools from transferring into their district. In late April 2013, HB658 was introduced as a fix, allowing school districts the ability to not accept students from out-of-district failing schools. It became law in May 2013. 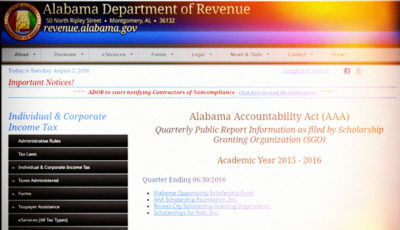 The two bills together are considered the full Alabama Accountability Act. (1) Nothing in this section or act shall be construed to force any public school, school system, or school district or any nonpublic school, school system, or school district to enroll any student. (3) Nothing in this section shall be construed to authorize the violation of or supersede the authority of any court ruling that applies to the public school, school system, or school district, specifically any federal court order related to the desegregation of the local school system’s student population. Section 9(g) of HB658 uses the exact same language. Guess they wanted to be darn certain that school officials could exclude students from failing out-of-district schools. What Criteria Are School Officials Using to Keep Kids from Failing Schools Out of Their Districts? It appears that school districts are simply relying on their residency policies to stand as the barrier for students attempting to transfer into their schools. The law did not mandate school officials or boards of education to develop a procedure to enroll students from out-of-district failing public schools. It said only that they could do so if they chose to do so. Only 2.2% of the 789 students that transferred out of failing public schools transferred to a non-failing school in another district. I can’t help but get the feeling that districts see themselves as private school systems with the ability to choose who to enroll. The arbitrary use of a residency policy seems to be a convenient way to keep students out. After all, many school districts allow teachers’ and employees’ children to enroll in the district even though the family doesn’t live in the district, and thus doesn’t pay the local property taxes so many districts utilize for the extras. How can school officials justify admitting some out-of-district students and not others? The Southern Poverty Law Center (SPLC) filed a lawsuit in August 2013 questioning whether the Equal Protection Clause of the Fourteenth Amendment of the U.S. Constitution has been violated because of the discretion school districts have to deny access to non-failing public schools and that real options for transferring out of non-failing public schools may not exist in reality. Arguments were heard in federal court in Montgomery in early February. UPDATE: April 11, 2014 – U.S. District Judge Keith Watkins dismissed the SPLC’s lawsuit on April 8. The SPLC will appeal the ruling. In lieu of the judge’s ruling whether to allow the lawsuit to proceed, take a look at the maps and consider whether real options exist for students in all of Alabama’s failing public schools. NOTE: I do not like to use the term “failing” school. I do not believe that schools fail. 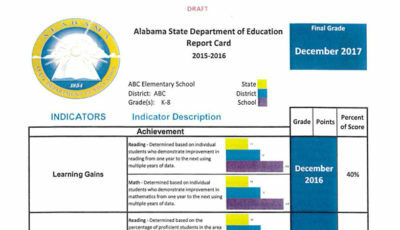 The Alabama Accountability Act mandates the identification and label of failing schools. It is for that reason only that I use the label here.